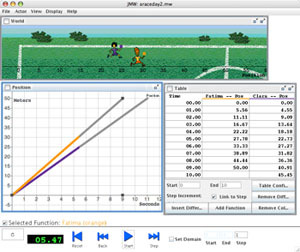 Read about SimCalc in the American Education Research Journal. Democratizing the Math of Change! This project investigated the scale-up of an innovative integration of technology, curriculum, and teacher professional development aimed at improving mathematics instruction in grades 7 and 8. A random-assignment experiment with about 60 eighth-grade teachers, which replicated the seventh-grade experiment but with regional leaders providing the teachers with all professional development through a typical train-the-trainers model. Data collection from the seventh-grade teachers as research and professional development support were reduced in later years. Case studies in seventh- and eighth-grade classrooms aimed at providing more detailed qualitative data to support interpretation of experimental results and specifically to examine how the innovation interacts with student diversity. We continue to advance and build on this work through follow on work and proposals. We have received about $900,000 of funding to carry on related work in Pinellas County, Florida (through private foundations). Nicole Shechtman recently received an NSF award, #1008770, for related work that investigates students affect in mathematics classrooms. A MSP proposal to further build on this work is pending. This material is based on work supported by the National Science Foundation under Grant No. 0437861. Any opinions, findings, and conclusions or recommendations expressed in this material are those of the authors and do not necessarily reflect the views of the National Science Foundation.